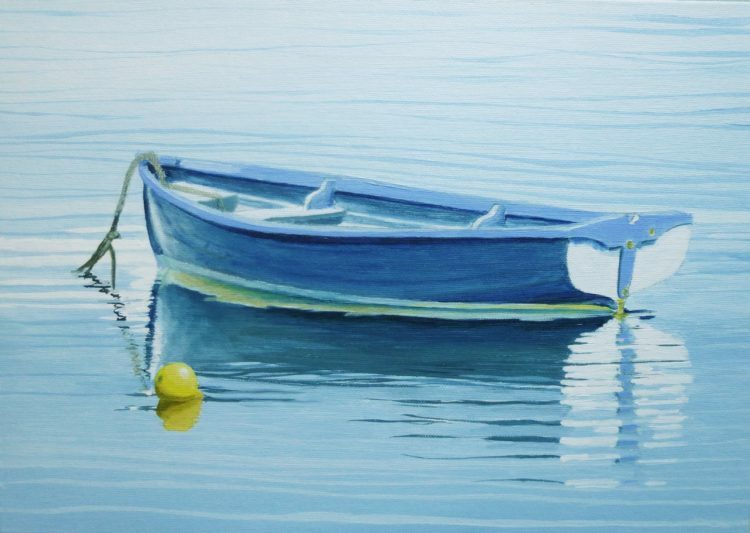 The last day of June – so time for a new canvas print – and this one is of a little Heybridge Basin dinghy that I painted earlier this year. The estuary was dead calm, and everything had wonderfully clear reflections. This is a limited edition – just six copies available – as usual, and is available to purchase direct on the Canvas Prints page. 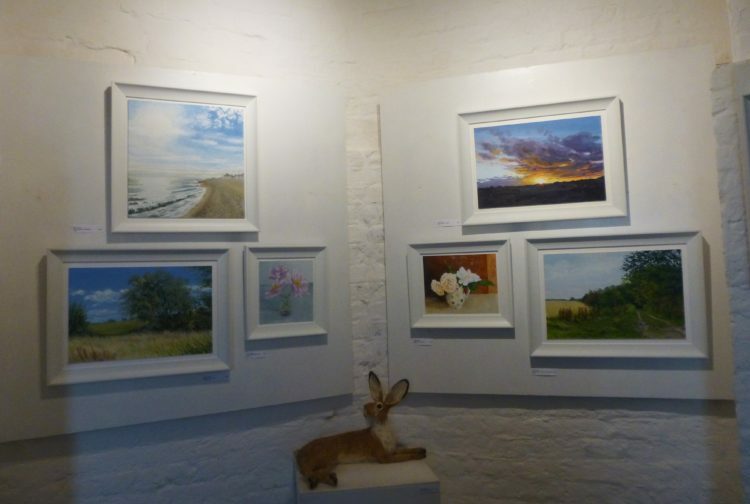 Print 1/6 is actually at the Naze Tower gallery at present, so is available to buy there. A new dinghy finished yesterday – this is Waiting for the Tide III, and is a West Mersea dinghy, sitting on the wet mud in the sunshine at low tide. 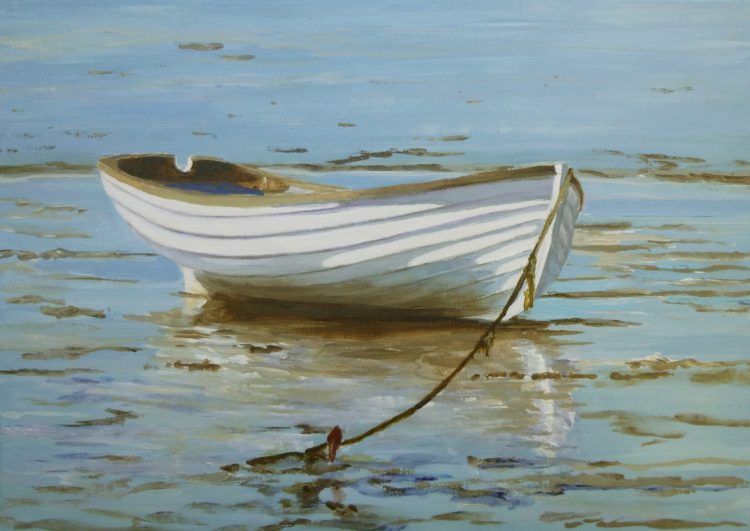 This, along with Blue Fenders, Blackwater Reflections, Essex Wood: May and Essex Wood: June, Essex Field Path II and another one yet to be painted, are all off to the Haylett’s Gallery in Maldon next month for the Essex Women Artists Exhibition. Yesterday we went in the opposite direction, down to the Sentinel Gallery at Wivenhoe to see the current show by Valerie Armstrong and Stephanie Stow – but what really struck me was what a stunning array of ceramics Pru Green has got in the display space of the workshop. Really colourful, a lovely lot of Pru’s own work, but other potters as well, including Sara Paynter, whose work I always admire. Lots of jugs, and mugs and bowls – if you’re on the look out for a really nice present for someone, head to the Sentinel! I’m really pleased to share that I’ve been invited to take part in an exhibition of Essex Women Artists at the Haylett’s Gallery in Maldon this summer! 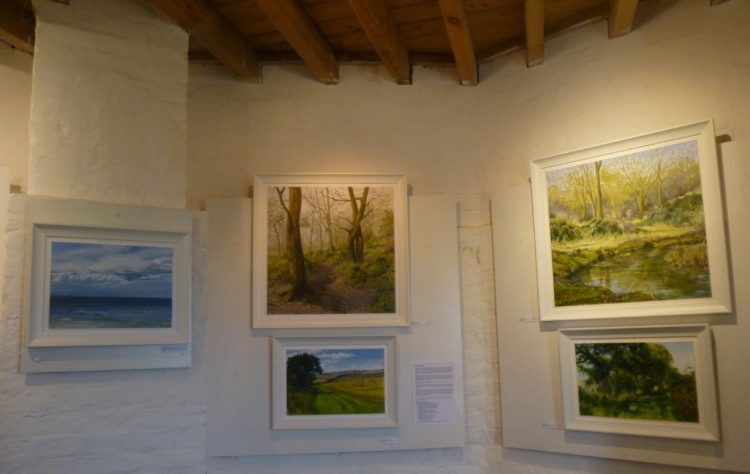 It is starting on 23rd July, and runs through till 3rd September – so lots of time to view, although take note that the gallery is closed on Mondays. I’m getting ready for my next ARTSTUFF stall at St Leonard’s Summer Fete, on 9th July – as you probably remember I sell my greetings cards, and various other merchandise based on my paintings. And this time I’ve got two new items that I’m pleased with: cotton shopping bags, with nice long handles, and mugs. 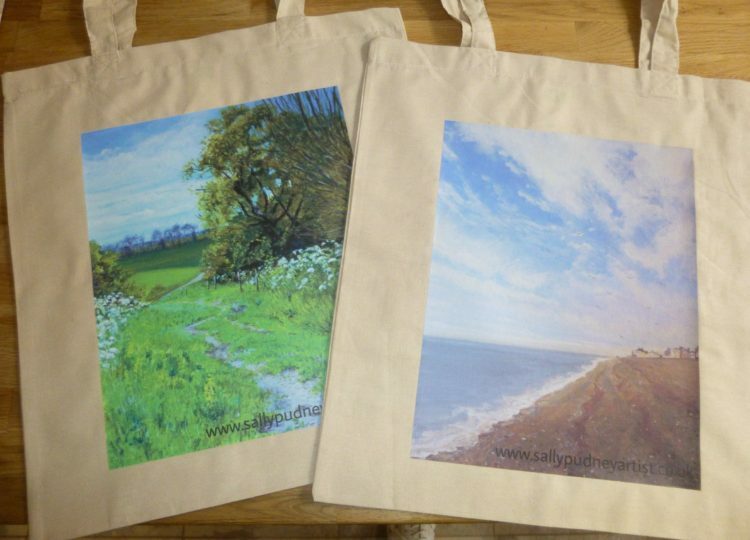 Last year, for my stalls and Open Studios, I had jute bags with some of my dinghy painting designs printed on them; they were really nice, but I thought I’d go for something a bit different this time. These cotton bags would be easy to roll up and keep in a handbag – so useful when you forget to take a ‘proper’ bag with you, and you’ve just popped into the supermarket for one or two things which turn into six or seven . . . ! The two designs are Breezy Day at Aldeburgh, and Essex Field Path. I only have 3 of each design at present, but I’ll get more for Open Studios if they seem popular. I had mugs made up for the first Open Studios I did, and last year several people asked me if I had them for sale again – but I didn’t! So I thought I’d better get some more done. I’ve had them made in three designs as you see, and they have the title of the painting round the other side. 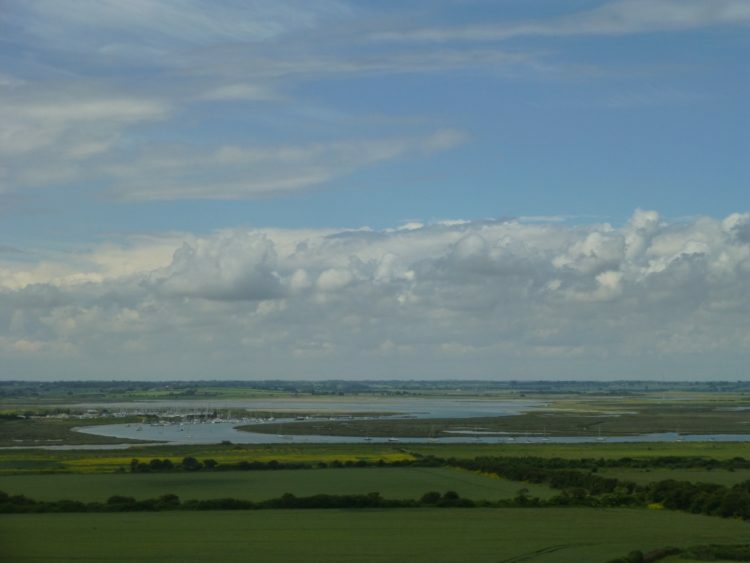 So, from the left, there is Essex Field Path II, Summer Afternoon on the Stour, and Dunwich Beach. It’s good to have a bit of a try out of new stuff before Open Studios – and just to give you advance notice, if you’re in the area, this year I’m participating in Colchester and Tendring Open Studios over TWO weekends this year – 17th & 18th September, and 24th & 25th September – and I’d love to see you, so put it in your diary now! I’ve been working hard for the last three days, and have just finished the sixth BIG painting in my Essex Wood series. I took some photos as it went along, so here are a couple of working shots and then the finished painting. It’s hard to believe that I have now completed half of my Essex Wood project. 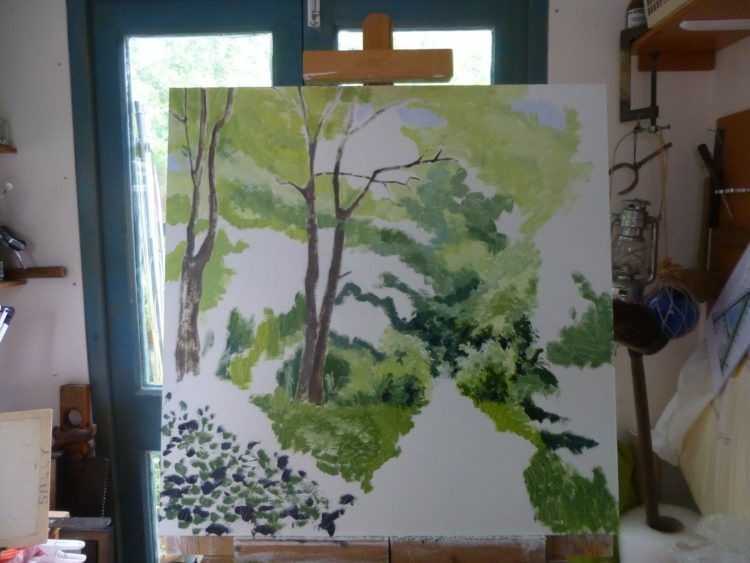 Only six more big paintings to go – and already I’m looking forward to painting the colours of autumn in my wood! So, here it is! 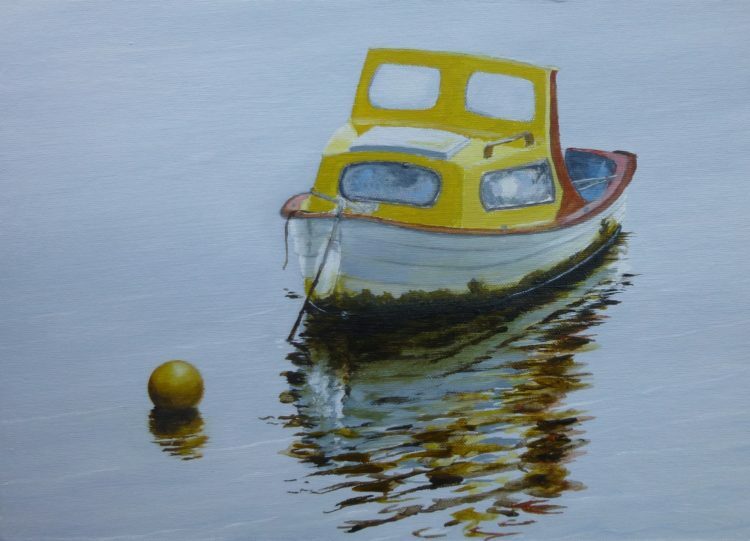 This is a little boat I found at Heybridge Basin, when the estuary was as still as a millpond, and all the boats had wonderful reflections. 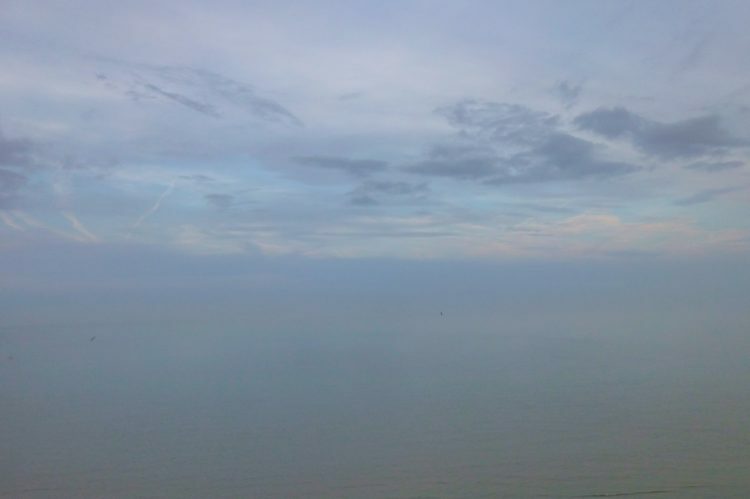 My sister came down from King’s Lynn yesterday and we went down to Walton so that she could see my exhibition at the Naze Tower. 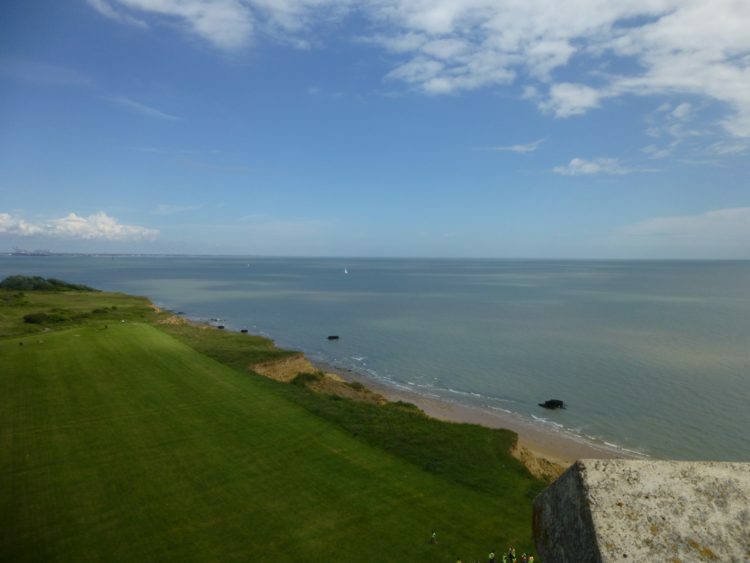 The weather couldn’t have been more different from last Saturday, and we had blue skies and far reaching views from the viewing platform at the top of the tower. Looking inland over the Walton Backwaters, the setting for Arthur Ransome’s book, ‘Secret Water’, in his ‘Swallows and Amazons’ series. 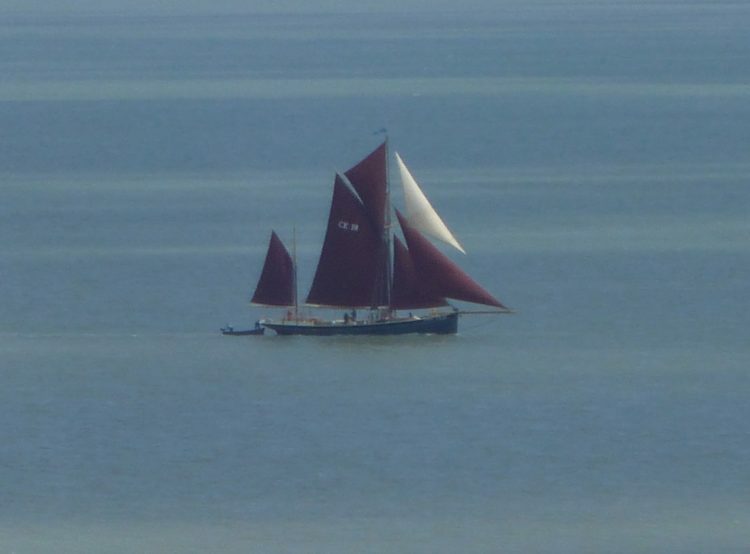 And while we were up on top of the tower, we were lucky enough to see ‘Pioneer’ sailing past. 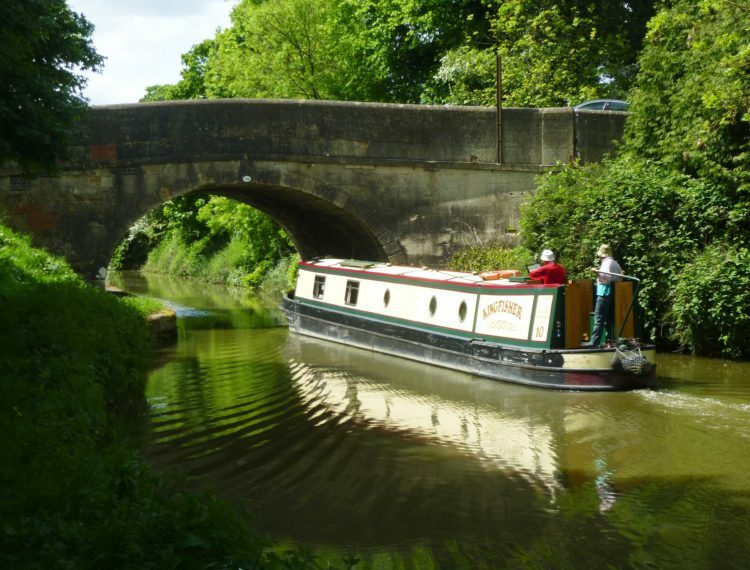 Pioneer is the last of the ‘Skillingers’, the large Essex First Class Smacks – Pioneer is 71ft in overall length. 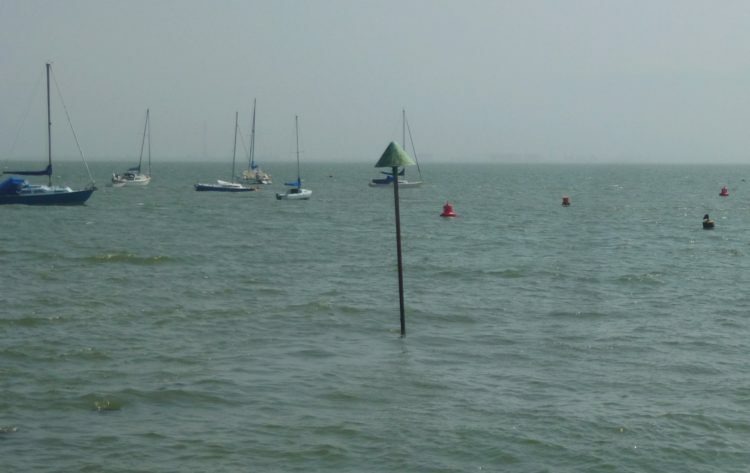 She was dug, as a wreck, out of the mud at West Mersea, and completely restored starting in 1998. Her fascinating story is told in the Jardine Press book ‘Pioneer: Last of the Skillingers’ which was published in 2004 and it is a really interesting read. She was originally built in 1864. What a magnificent sight she is today! I’ve almost finished another little boat painting to be called ‘Blackwater Reflections’ – probably up on the website tomorrow. 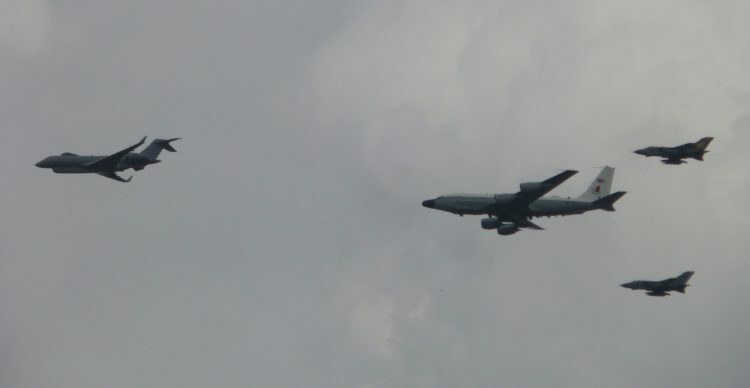 Yesterday the Queen’s birthday flypast roared over Lexden, very low! 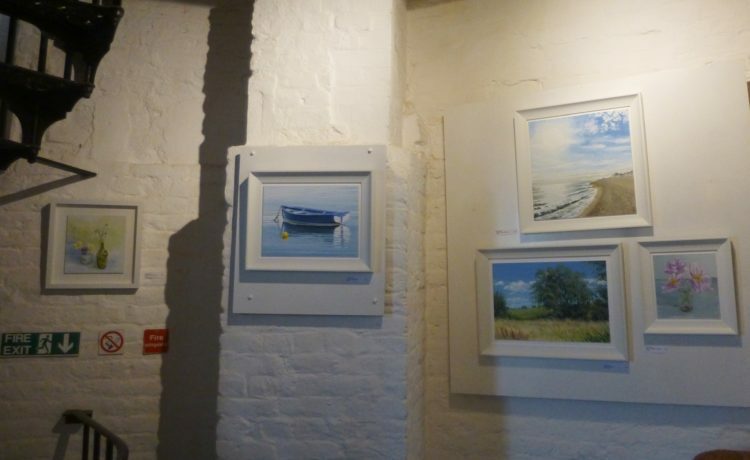 And in the evening it was the Private View of my solo show at the Naze Tower Gallery at Walton on the Naze! Yay! I’m not sure it was quite the best day to have it, as there was so much going on to celebrate the Queen’s official 90th birthday that many of those invited were unable to come – even Graham is away at present – but most of the other artists showing were there, and some of the Friends of the Tower, and a few previous ‘buyers’ of my work came, and I was very pleased that my friend Christina was able to come. And all in all we had a good evening, despite the strange muggy/sudden torrential downpours kind of weather! 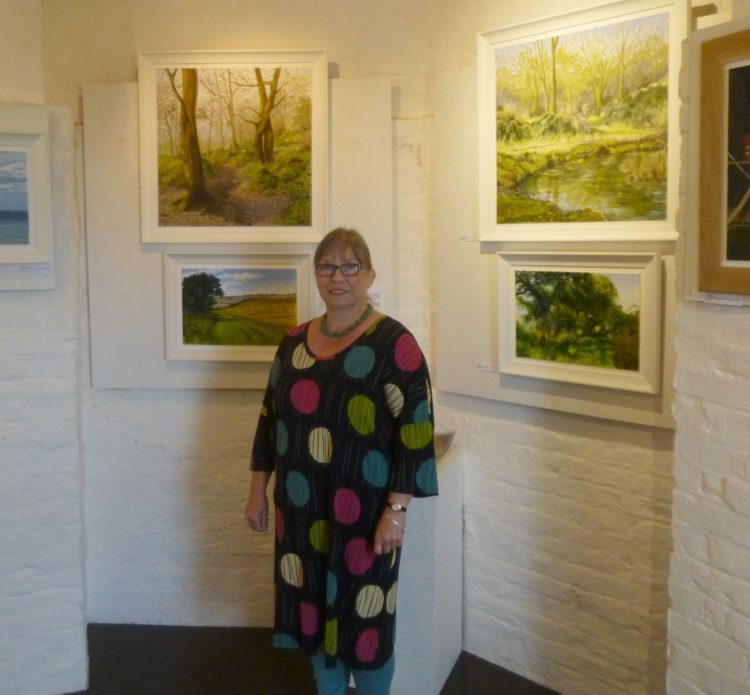 I went early, so that I could take some photos before anyone else was there, and Dawn Hall, who was exhibiting some of her sea and marina paintings, took this photo of me with some of my paintings. 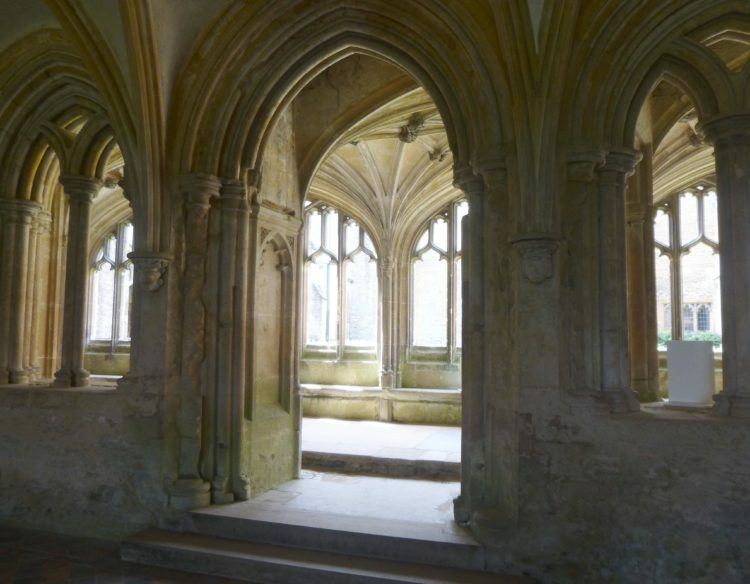 The rooms are octagonal, so it is quite hard to photograph the pictures, but here are a few to give a bit of an idea . . .
At the end of the evening Christina and I went out onto the viewing platform on the roof of the tower – after the heavy rain we had earlier in the evening the view out to sea was very misty with no distinction between sky and sea . . .
. . . but the view west was lovely, with the setting sun shining out beneath the storm clouds. 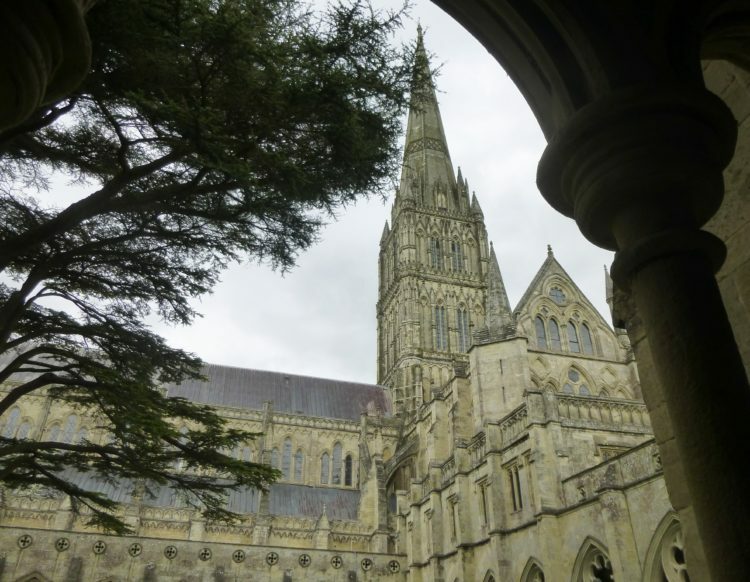 If you’re in the area and would like to visit, the Tower (CO14 8LE) is open daily from 10.00am – 5.00pm. There is a small entry charge of £3.00 adult, £2.50 seniors and students. 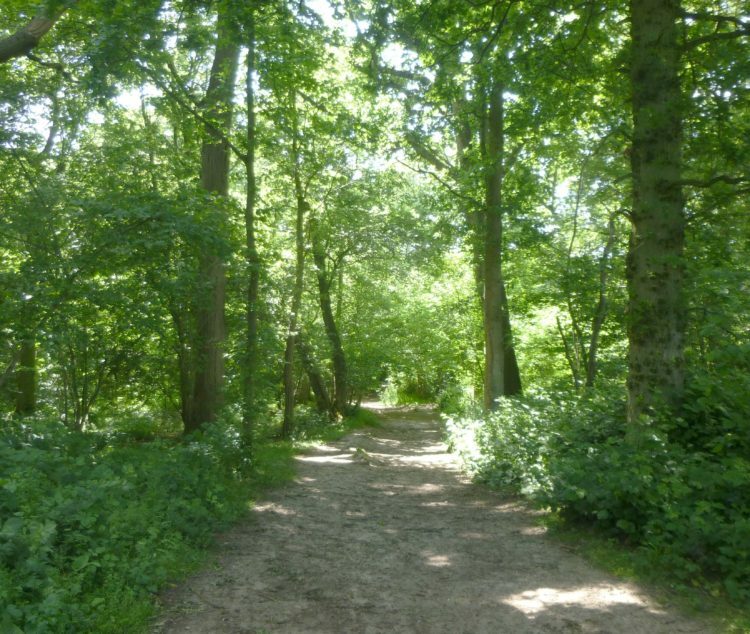 I had planned to visit my wood quite early this morning, for the June visit of my ’12 Months in an Essex Wood’ project. When I drew the curtains, though, it was dull and overcast, so I thought I’d put it off, and maybe go next week. HOWEVER by 1.00pm the sun was shining and it was a beautiful afternoon, so I changed my mind and went! The wood seemed very shaded, and cool and quiet, and very, very green. 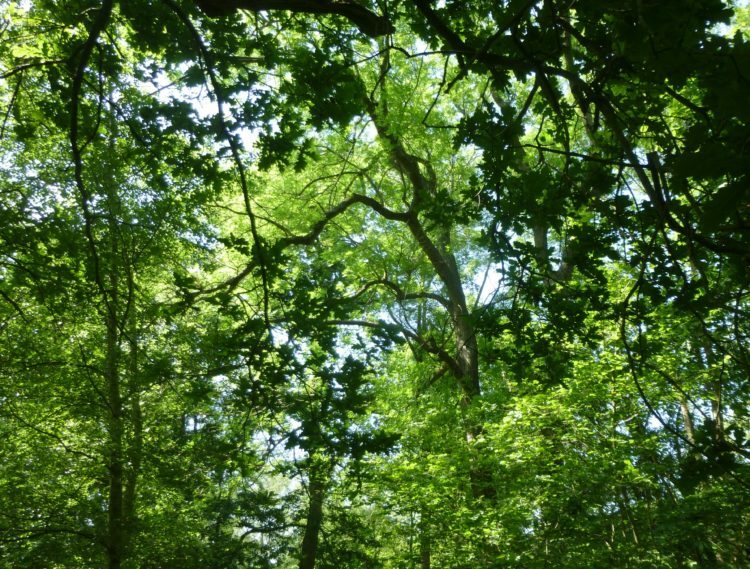 The leaf canopy is really quite thick now . . .
. . . and the blue bells and the white stitchwort are long gone. In their place bracken has grown up, blackberry brambles – some of them in flower – ground elder, and that sticky trailing plant that I think is called cleavers. 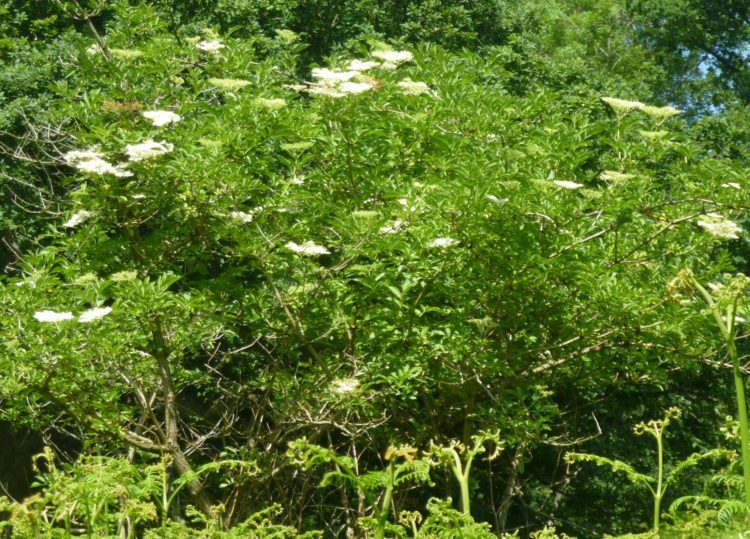 The elder trees are flowering . 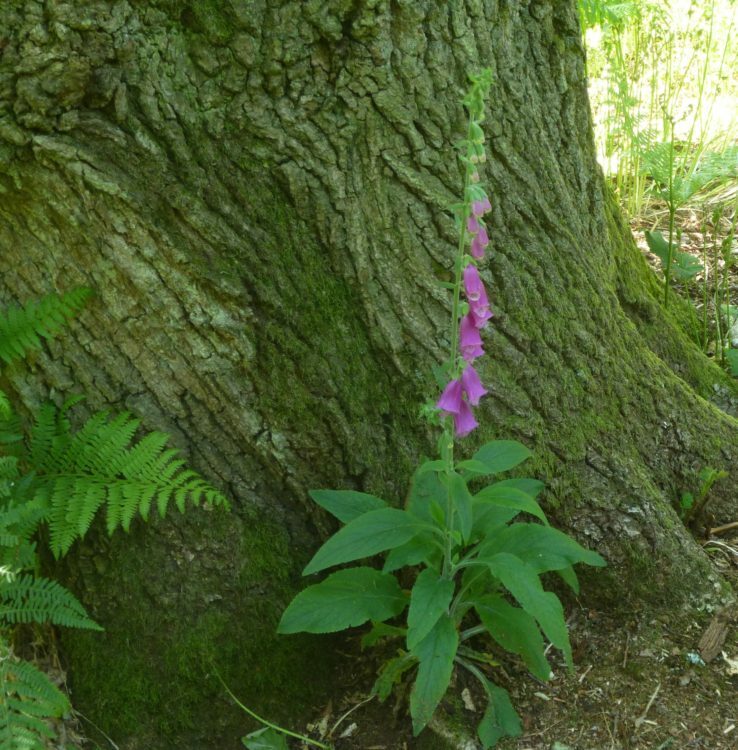 . .
. . .and in the more open places there are lots of red campions still, and also foxgloves – some in rather strange places . 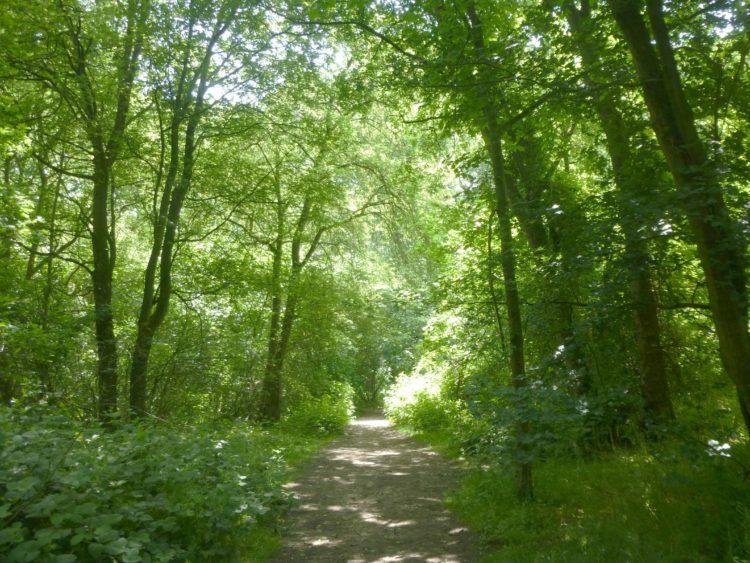 . .
Last month the wood was loud with bird song. This month, partly because it was the afternoon I expect, it was much quieter. Rooks called intermittently. A blackbird had a burst of song, and the wood pigeons cooed away high up in the branches. I heard a green woodpecker’s wild laughing a few times, and I saw a beautiful jay. There were a lot of young squirrels running around amongst the trees. The stream on the boundary of the wood was flowing fast. 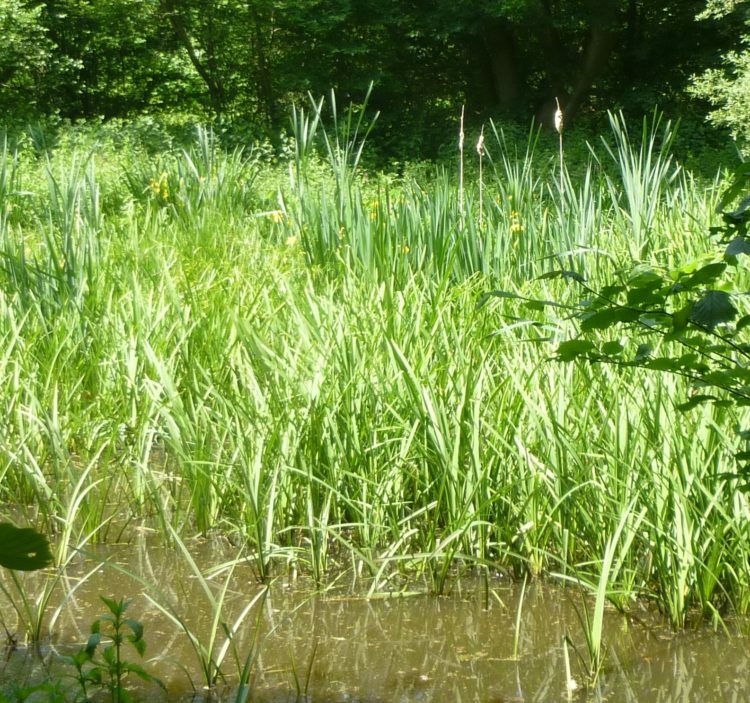 but the big pond that I painted in March is almost completely overgrown with reed mace and yellow flag irises. 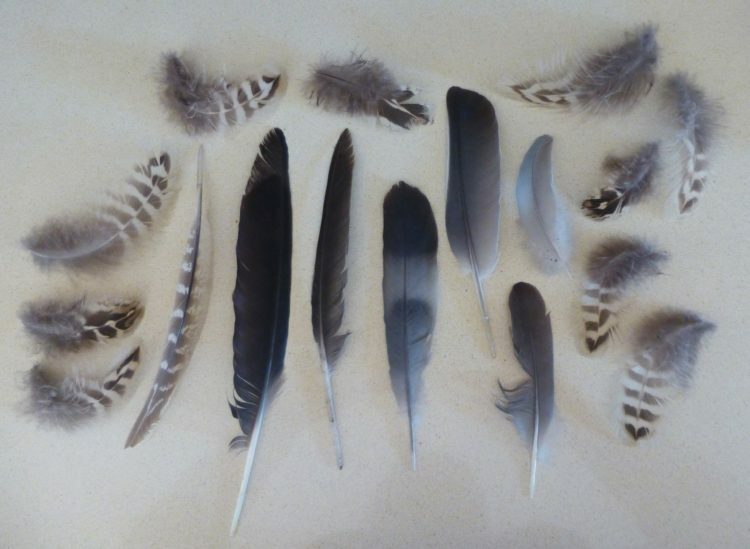 And my ‘findings’ from the wood this month? 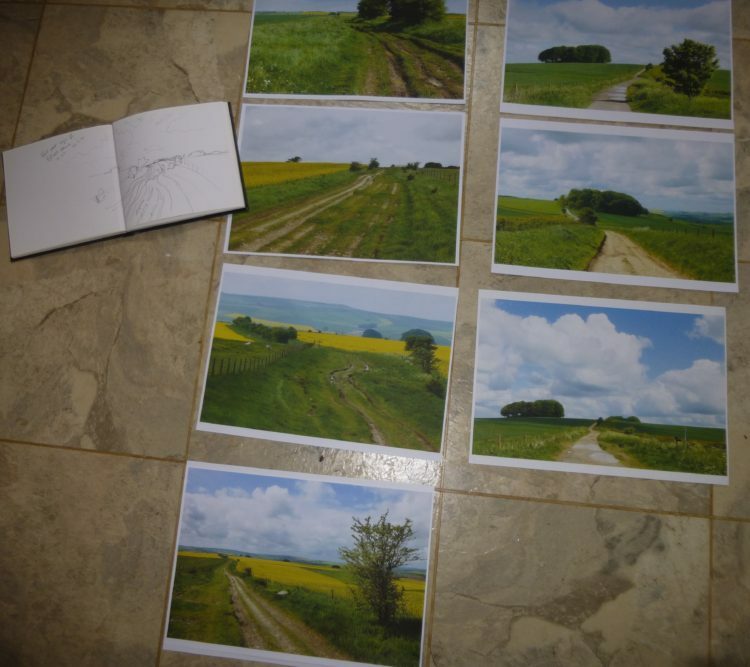 I’m a bit late getting this completed, but fortunately I made my May visit to the wood straight after the Festival finished and before I went to Wiltshire, so I had the drawings and photos I needed, and I’ve been working hard the last few days to get this done. 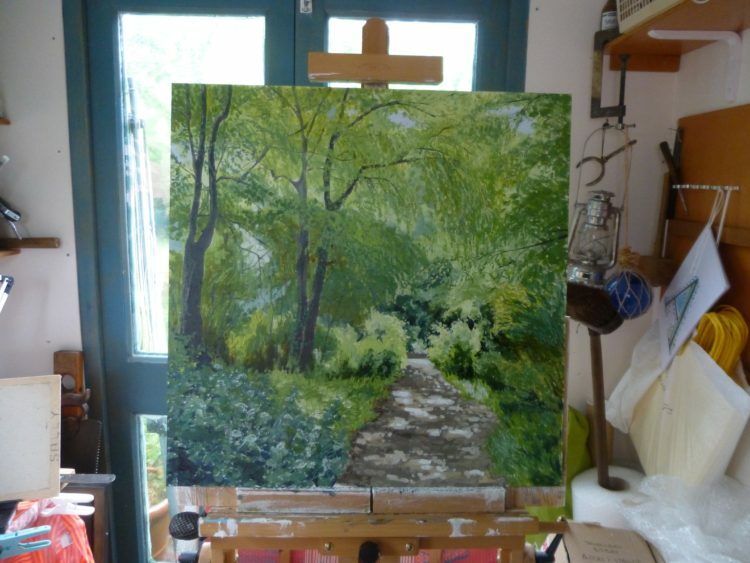 Each day when I stopped painting I took a photo – it makes rather interesting viewing to see the stages developing! 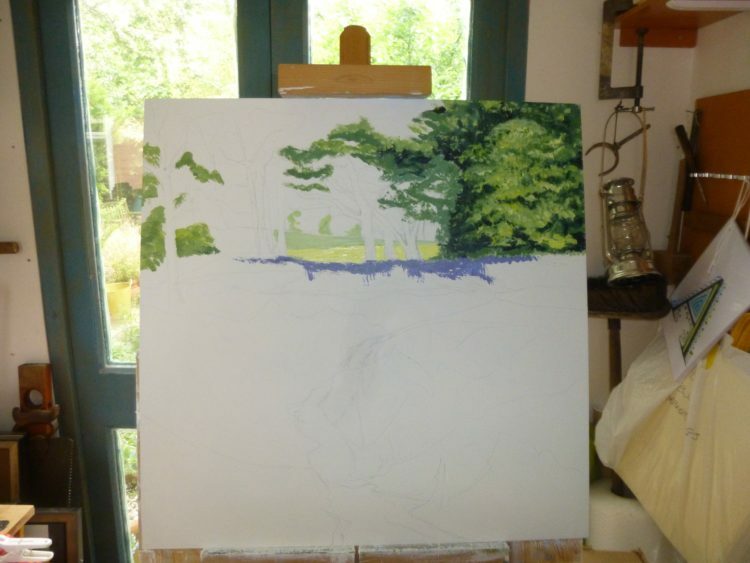 Day 1 – a lot of drawing and thinking but not much paint! 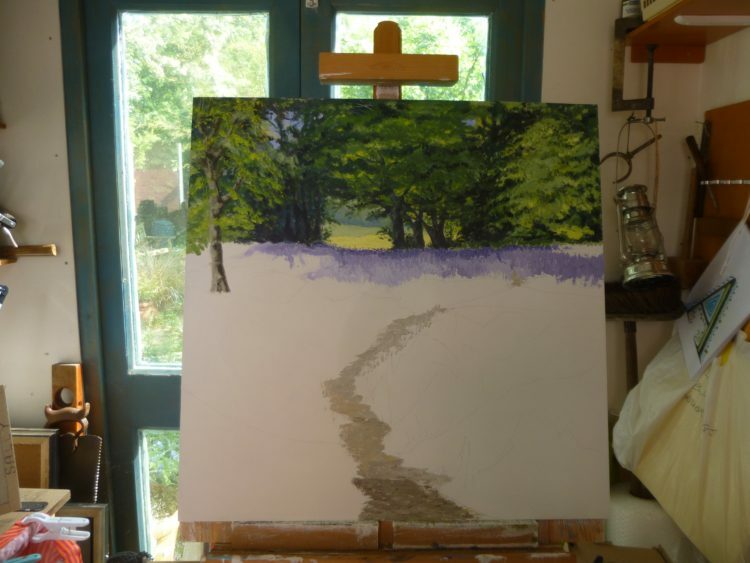 Day three – the board is covered in paint, but there’s still lots to do! 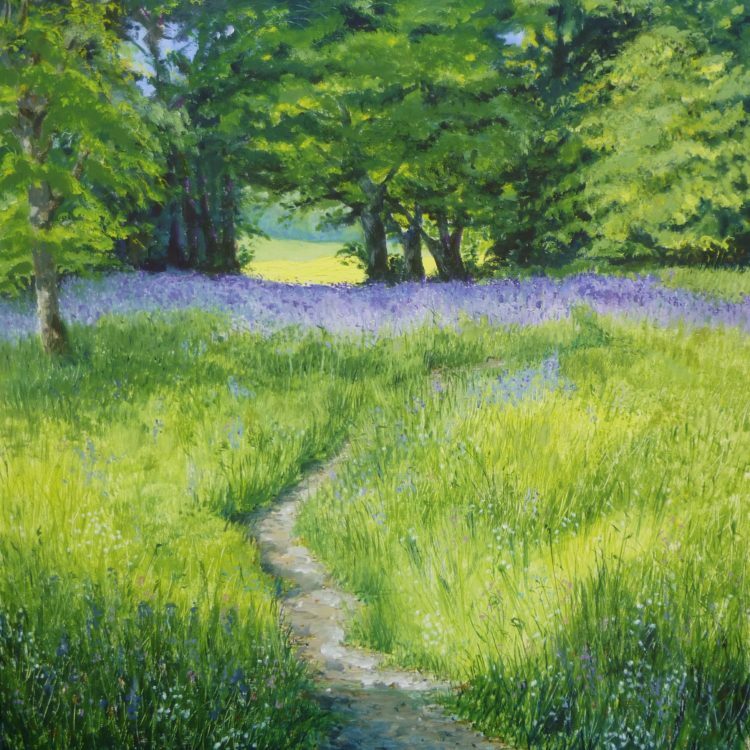 If you compare this with the finished painting below you will see quite a few changes; look at the line of the path, the trunk of the tree on the left, the thick band of bluebells, and the detail in the grass and the foreground shadows. 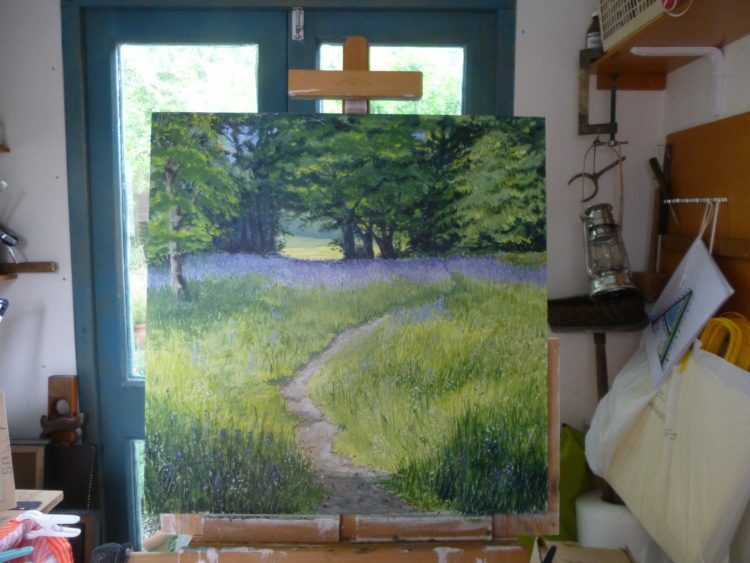 Essex Wood: May – all finished! And this morning I delivered 20 paintings, 10 canvas prints and 110 cards to the Naze Tower Gallery at Walton on the Naze, ready for my exhibition which starts next Saturday. The Private View evening is next Saturday – if you live in the area and would like to come, leave me a comment or drop me an email to sally@sallypudneyartist.co.uk with your postal address and I’ll get an invitation out to you. 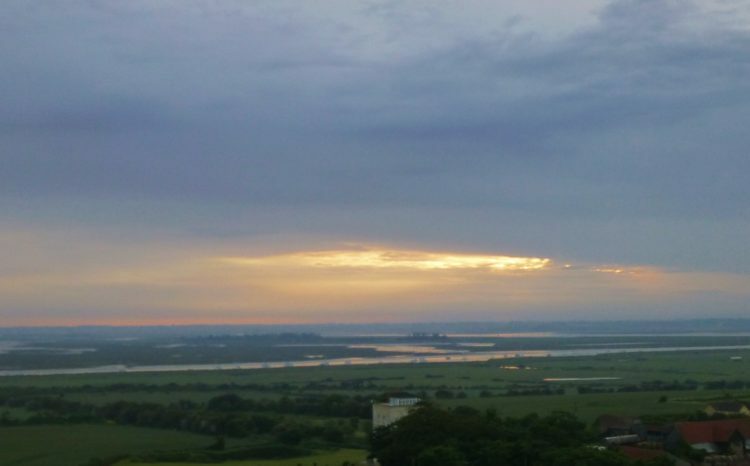 Yesterday afternoon I went down to Leigh on Sea for the Leigh Art Trail 2016. 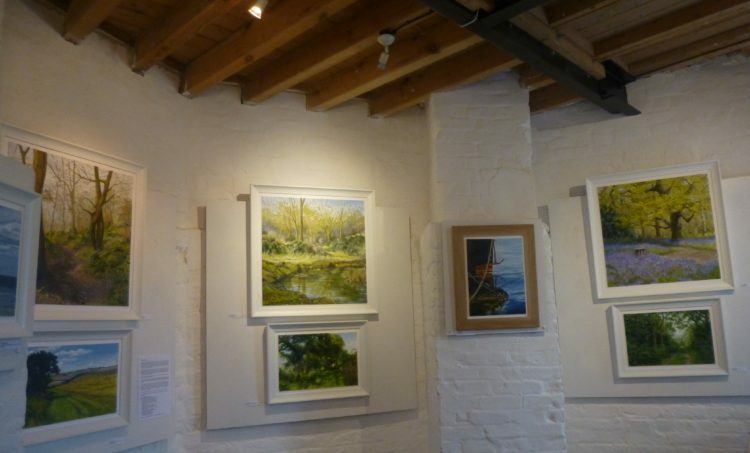 Two of our previous Lexden Arts Festival exhibitors were taking part. Jonathan Trim has taken over Moylans Interiors at 138 Broadway, SS9 1AA, and filled it full of his lovely paintings, prints and cards. He had already made lots of sales and people were buzzing in and out all the while I was there. Richard Baxter, who showed with us in 2015, was also taking part in his own pottery workshop and gallery, Old Leigh Studios at 61 High Street, Old Leigh, SS9 2EP. He was showing lots of exciting new work, some based on Anglo Saxon pottery, and he had some very interesting pieces that had a rich gold coloured glaze on the outside, which mysteriously came through the body of the clay during firing, and produce a lovely biscuit crackle glaze on the inside. He, also, had lots of customers looking, admiring and buying, and needless to say, I couldn’t resist a little dish! 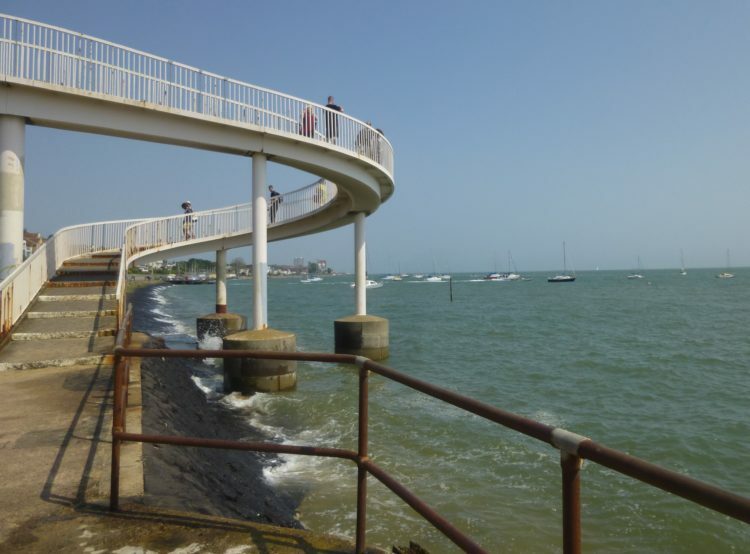 It was a beautiful hot sunny afternoon, and – for the first time ever in my visits to Leigh on Sea – the tide in the Thames was IN! Lots of people were out enjoying the sun along the front, and I had a good walk from Jonathan’s venue in the town, down to Richard’s gallery on the sea front, and then along to the marina, where a number of other artists were exhibiting in a floating barge, converted into an art gallery! 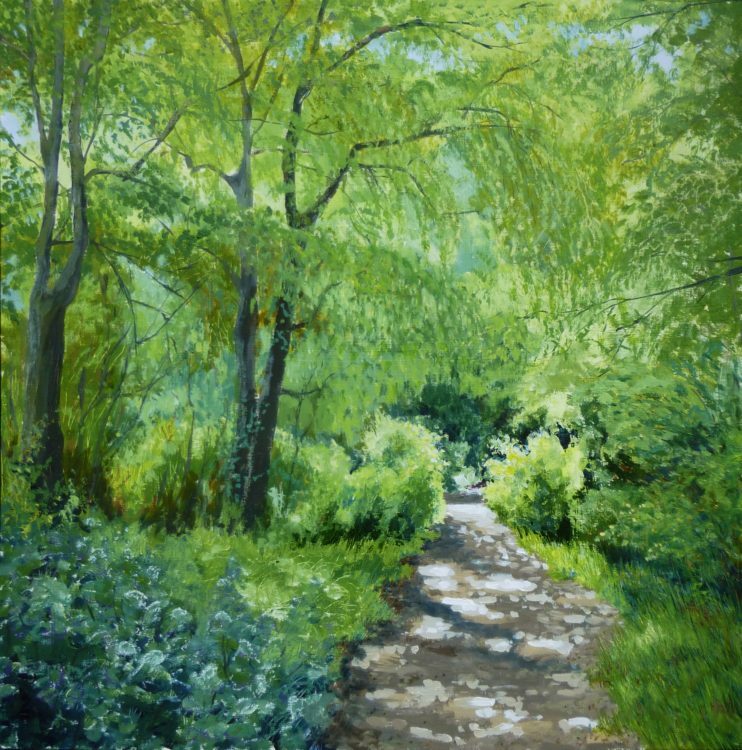 The Trail goes on till next Saturday, 11th – check out their website www.leigharttrail.com for all the details. 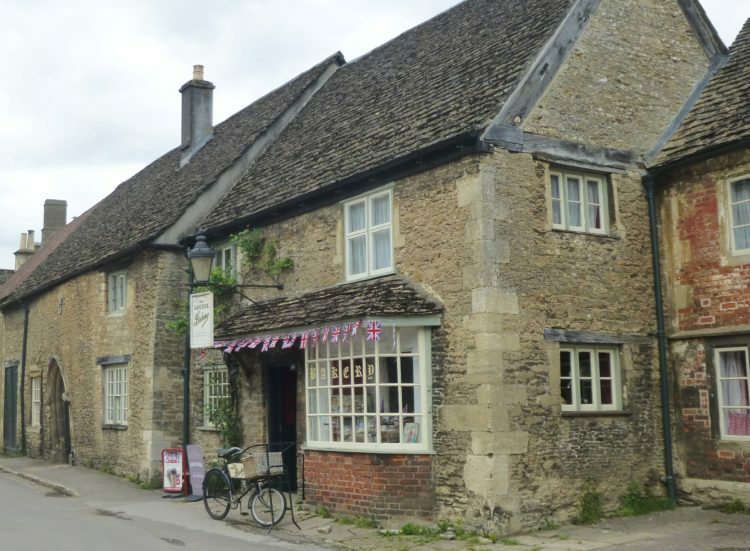 There are 31 artist’s venues all over the town, as well as other events happening. I parked in a little central car park in North Street, and there are several more near the sea, as well as lots of street parking all over. Well worth a visit, and it only takes 40 minutes to drive down from Colchester.